Hugh Hamilton Wines has a theme of Hugh being the black sheep of the family and this theme is branded right across the business. 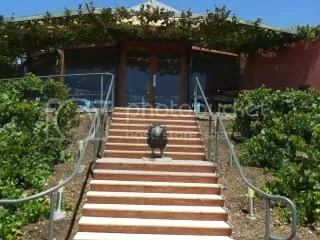 From the wine labels to the wine names to the merchandise and even the road signs entering the winery. The views from the cellar door are worth the visit alone. You can get about 300 degree views of the surrounding vineyard based countryside – just spectacular! For the location check out the Cellar Door Map. The merchandise is high quality and are really promote the Black Sheep brand. The white t-shirt range is a particular favorite with a play on some of the wine names – I will leave it to your imagination what “The Madam” looks like! They also have a wine club that allows you to obtain their rare wines, discounts and functions, on the basis of purchasing 2 dozen wines per year. You can check out the wine club and all the other aspects of this winery at their web site www.hamiltonwines.com.au. Along with the branding the wines are also something that is different and shows individual character. This wine is interesting if for no other reason that is has only 11% alcohol. Either the grapes for this wine were picked earlier than is normal McLaren Vale practice or alcohol has been removed from the wine via reverse osmosis technology. Either way the product is a light and refreshing infusion of fruit salad and citrus on the nose and grassy citrus on the palate. There is not as much acid on the finish as I would expect. The light nature of the wine means it is an excellent hot afternoon with family & friends. It would also work with a fish entree – I had a smoked salmon dish tonight that would have gone well with this wine. The grapes here are from 1975 planting of the “OF” clone. The subtle nose is a mixture of melons and guava. The melon theme continues on the palate with hints of tropical fruits. I normally think that Chardonnay should have some oak treatment to get the best from this variety however I could imagine drinking this with a Cesar Salad and enjoying the matching. An interesting expression of orange blossom and nashi on the nose followed by the nashi and lime finish on the palate. The 24 hour skin contact has waved its magic wand to produce a musky and Turkish Delight (both on the nose and palate) with a lovely stone fruit but dry finish. How about a plate of Salt and Pepper Squid. A blend of 85% Sangiovese, 10% Merlot and 5% Tempranillo. When I saw this wine on offer I straight away thought of the standard earthy and grainy taninic styles (such as from Coriole). I was wrong (again) – yes there was some earthyness on the nose but this was no where near being dominate. Instead I got hints of Rosemary and Cloves on the nose with a medium bodied cherries on the palate with smooth tannins. Any tomato based pasta dish would do justice to a bottle or two of this wine. I have not made is a secret that Merlot is not my drink of choice, as the style tends to be a softer and a short soft tannin finish. For my palate I tend towards the bigger red wine styles. That is a generalisation and I will admit generalisations can be dangerous to hang your hat on! Here is one of those times. When I tasted the wine my first thought was that I had the wrong wine poured into my glass as this wine had “body”! After checking the label I was convinced that, in fact, it was a Merlot I gave it another try. The nose was really nice spiced plums. Red plums continue on the palate combined with dark berries and a tobacco leaf finish. I would love to have this wine with some Italian Sausages with a pan fried melody of seasonal vegetables. WOW!!!!!!! This is the most pleasantly different example of Tempranillo. The nose had white pepper with preserved strawberries. Strawberries continued on the palate with plums and a soft tannin finish. Such a difference compared to other Tempranillo wines I have tasted, and I am better for this experience. Some of this wine came home with me and I look forward to drinking it with either grilled pork chops or one of my home made pizzas – now the only decision is do I share the wine! Shiraz does so well in McLaren Vale and for 2007 being a drought year the wine is of high quality and worth checking out. It has ripe fresh plums with cardamon and black olives mixed in. The palate has vanilla (from the oak treatment) with plums, spice and fine tannins on the finish. Nothing here is over the top and the components are well balanced. Bring on a thick juicy Wychwood Meats T-bone steak. I cannot help but think about lamb while I was tasting this wine – with no pun intended. This has the expected nose of blackcurrents but there are hints of freshly picked thyme and other spices. The palate continues with the blackcurrents and black olives with the oak as a supportive role only as there is a soft tannic finish. How could you not think of lamb with this wine? For the regular readers of the Lonely Grape would know that I am a sparkling red fan. Hug Hamilton used to make a sparkling Merlot that was not on my “to drink list”. Now this is some thing different – a sparkling Tempranillo Sangiovese blend. I just had to try this one. Well this was worth the visit to the cellar door! The nose had an earthy, spiced dark plums (fresh plums not stewed). When you drink this you are immediately seduced by a full bodied wine (hints of plums, olives and a little chocolate) followed by soft silky tannins. There is some sweetness here but not excessive. This “light fruity wine” is made from Gewurtztraminer – an unfashionable variety. It has been picked early and is only 11% alcohol. Hugh says that this wine is to be enjoyed and who cares about the wine snobs that would dismiss this wine. There is a mixture of musk lollies with rose water and the palate drives straight into tropical melons and lemon zest clean finish. I was surprised that there was 31 g/L in the wine as it did not seem overly sweet – there must be a lot of acid here to offset. Try something spicy with this – maybe a Thai Noodle Salad. Along with the usual alcohol nose tingle the nose was full of raisins, Christmas pudding and candied citrus peel. When tasted I directly thought of 2 words – luscious and lingering. The high viscosity of the wine coated the mouth with liquid raisins, peel and slightly burnt caramel – somebody please pass the blue cheese. This entry was posted in Mclaren Vale, wine and tagged Cabernet Sauvignon, cellar door, Chardonnay, Mclaren Vale, McLaren Vale Wine, Sangiovese, Shiraz, tempranillo, Viognier, wine. Bookmark the permalink.